Not much is known precisely about Giovanni Antonio Pandolfi Mealli (aka Domenico Pandolfi, 1629-?1687). He was born near Siena, raised in Venice, worked in Innsbruck for some years and later in Messina, Madrid and Rome. His first two printed opuses are lost, whereas the Op 3 violin sonatas published at Innsbruck in 1660 were dedicated to Anna de’ Medici. 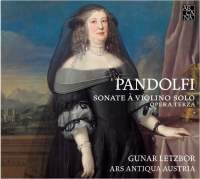 Violinist Gunar Letzbor has already recorded Pandolfi’s Op 4 sonatas (Arcana, 2011), and his rhapsodic playing is accompanied by a broad continuo group consisting of guitar, archlute, keyboard (switching between harpsichord and organ), violone and colascione (a long-necked southern Italian lute). The arsenal of five continuo instruments yields furious flurries of scampering chords in the Adagios that flank La Cesta, and yet there is sweetness and intimacy in slower movements notable for their expressive melodic chromaticism (eg the second movement of La Melana or the ciaconna at the heart of La Castella); these tend to be when fewer continuo players are involved. Those who prefer the scale of just two instruments might remain happier with the vibrant Gramophone Awardwinning set by Andrew Manze accompanied by Richard Egarr only. Letzbor’s extrovert fantasy and Ars Antiqua Austria’s richly textured playing should win some friends, and certainly suggests how Pandolfi paved the way for Biber.